With the cost of fuel always on the rise, the interest in alternative renewable energies becomes more urgent. According to MIT Technology Review, a technology known as photovoltaics is being tested to see if it is adaptable to the solar energy industry. It works by using a large lens that focuses light directly onto a very small section of photovoltaic semiconductor material. Although this method saves a lot of money by using only a tiny segment of the semiconductor material, the concentrated light is extremely hot. The vast amount of heat generated by focused sunlight not only makes the chip too hot to function, but as the temperature of the chip goes up, its efficiency goes down. The only thing standing in the way of using photovotaics in producing energy efficient solar energy is the intense level of heat generated. 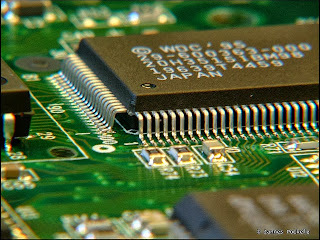 IBM recognized this dilemma as being very similar to its quest to cool down computer chips. Using its long experience in cooling computer chips, IBM experimented with using the same system to cool the photovoltaic material, which involves transferring the heat from a photovoltaic cell to a water-cooled heat sink. That method did not prove effective because there was not enough surface area between the two surfaces. A new solution that works better is putting a very thin layer of liquid metal between both surfaces. The metal has an extremely high degree of thermal conductivity and due to its liquidity, it can be as thin as 10 micrometers. The team experimenting with this method has been able to focus what amounts to 2,300 times the natural energy of the sun onto one centimeter worth of chip. The natural temperature would be more than 1,500°C and would vanish into thin air, but by using the water and liquid metal cooling system, the photovoltaic material remains a cool 85°C. Although the new technology is not in place yet, the search is on for a company that can create the concentrated photovoltaic system. When the technology is in place, it is sure to bring down the price of creating solar energy and make it more cost effective as an alternative energy source.